For tourists, I think that the Philippines is an often overlooked destination. This is probably because of the long flight (14 hours from the West Coast). The journey there is worth it, though. There is much to do and see, with low prices a big attraction. Foremost, always, Filipinos are warm and welcoming. We have been to this country three times and enjoyed such varied activities as exploring historic Manila, swimming with whale sharks in Donsol, hiking in the lake country of Negros Oriental and diving in the marine wonderland of Dumaguete. Most of all, though, we loved our time in the tropical paradise of the outlying Palawan Islands, specifically at El Nido Resorts. This March, during a two-week trip, we spent three days in Manila. Our base was the excellent Mandarin Oriental hotel, located among tall skyscrapers in the Makati financial district. While there we chose to go to famous Taal Volcano. It was good decision – an exhilarating adventure awaited us. 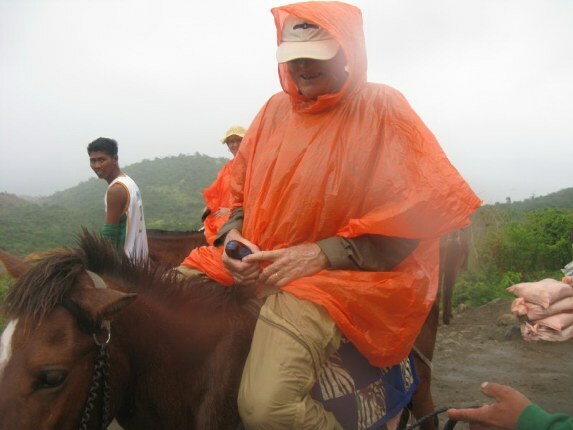 It was raining when we reached Taal, one of the world’s special areas. Its uniqueness is hard to describe, but picture a Russian doll set with dolls inside dolls. Taal Volcano, likewise, makes up the largest Island within a lake which has a smaller lake within it with a tiny island. A question from an online site asks this: “Where in the world can you find an island on a lake on an island on a lake, on an island on an ocean?” In order to get there we traveled to Tagaytay city, where we took a boat across the first lake to the crater island. There was a light rain and rough waters, and our plastic ponchos were little help in keeping us dry. The weather was warm, so the half-hour sail wasn’t too bad, just a little choppy. Once there we were met by local guides with small Filipino horses. On tours, guests are given the option of taking an hour’s hike on the rugged lava trail or riding up to the rim. Our tour included the ride. It was led by a guide with rope in hand, and our little horse was sure-footed on the slippery terrain. The primitive saddles, however, added to the adventure as we rocked back and forth, striving to stay on. Located on the island of Luzon in the Philippines about 44 miles south of Manila, the volcano has been relatively quiet since 1977. In 1991, however, it started showing signs of unrest, with strong seismic activity and ground-fracturing events. 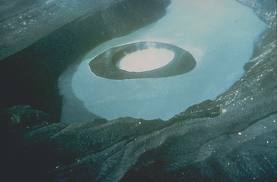 Because of its proximity to populated areas and its eruptive history, the volcano was designated a Decade Volcano, worthy of close study to prevent future natural disasters. Along the way, we saw first-hand evidence of sublimated fury – hot bubbling mud pots and spouting mud geysers. Once at the top, we dismounted for the short walk to the spectacular view point from the ridge. Before us, we saw the crater, lake and small isle. This awe-inspiring sight has become a trademark view used for Philippine promotion. The area has also been declared a National Geological Monument and proposed for the UNESCO World Heritage List. We saw hikers below on the lake shore. There were no swimmers that day but many venture into the warm water. They are advised not to stay in too long because it contains sulfuric acid and other chemicals. Both coming and going from Manila, the drive is beautiful. On the way there, we stopped off at the Tagaytay market. A busy central area of the town featured two large markets – one with a huge array of locally grown produce and the other filled with meats and fish. Along the way, we passed several stands selling varieties of rice in different sizes and colors. As well, there were those selling local “fast food.” A young girl, for example, was skewering marinated intestines for barbecue. Just downstairs from the produce market was the terminal for the local transportation – motorcycle-like tricycles which carry two or three and the large Jeepneys, which are larger than a jeep and smaller than a bus and can carry a dozen or so comfortably. Returning on another route, we saw pleasant countryside with rice paddies which soon yielded to suburban housing where commuter families live. El Nido, the secluded island resorts in the Philippines, has always been the perfect tropical paradise. Now with its upcoming expansion, it will get even better for its guests. Located in the country’s Palawan Islands, El Nido added a new location in 2010 and is set to open another, Pangalusian, this October. Minoloc (1981) and Lagen (1998) were the first two, then came Apulit in 2010. The most luxurious so far will be upcoming Pangalusian. All are located an approximate 75-minute flight on a small prop plane from Manila, followed by a short boat ride. 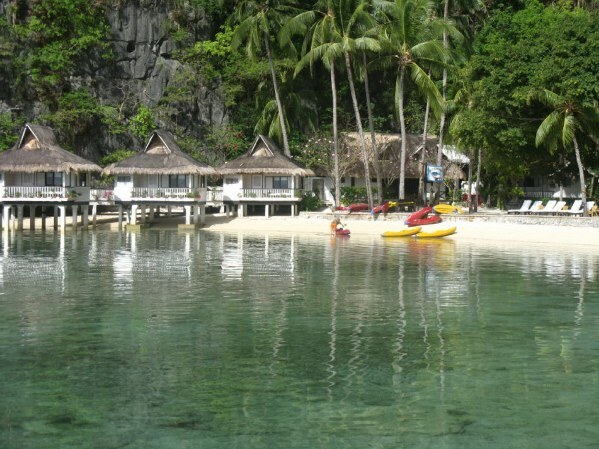 The Palawans, as a whole, consist of some 1,780 islands and islets, most with rocky coves and pristine white sandy beaches. When the flight descends, guests see a breathtaking panorama of scattered green dots of land in a turquoise and blue sea. Accommodations rank with the world’s most highly rated resort hotels – an international menu features delicious selections; activities offered satisfy the most adventurous; and those seeking relaxation and pampering are catered to. Prices are less than would be expected in international destinations of this caliber. All have 50 air-conditioned rooms. Built right off the beach, Miniloc is shaded by palm trees and framed by a backdrop of sheer limestone cliffs. In front, the warm, crystal clear waters teem with tropical fish. Off the dock, guests can snorkel alongside four-foot jacks and hundreds of multi-colored tropical fish. On Lagen rooms are either over water or set in a lush forest, several yards from the beach and pier. The sprawling grounds cover more than 400,000 square feet and contain a diverse variety of birds and mammals. Amenities in Lagen include a swimming pool and spa suite. A great place for birders and hikers, a trail in Lagen leads through the forest and down a hill to a private cove. Along the way on our hike, a family of long-tailed macaque monkeys greeted us from up in the trees. They seemed to taunt us, vigorously shaking leaves from limbs onto the path. At trail’s end, we saw that our snorkel equipment had been delivered by boat. After resting, we set out for the spectacular snorkel around a steep drop off back to the resort. Apulit is built in Philippine traditional architecture mixed with contemporary design. All units are over water, making it easy for guests to watch the harmless black-tip sharks circling below. This site caters to a diverse market with over 20 large deluxe sea-view rooms for families. The new Pangulasian fronts a pristine 820-yard stretch of white sand beach with a marine sanctuary right at its doorstep, along with diverse array of animals and plant life thriving in its forest. Visitors can see both sunrises and sunsets here. At all locations, during dinner, an activity coordinator visits guests to schedule activities for the next day. Among options are diving and snorkeling, sea kayaking, rock climbing, hiking and fishing. Lots to choose, but some may want to just relax on their patio or on the beach under an umbrella lounge. It’s a great place for kids, by the way. Families on kayaking expeditions are a common sight. We are avid snorkelers, and most evenings selected which of many prime locations we would visit the next day. We were usually provided with our own snorkeling guide who stayed with us most of the time at each of the three resorts we recently stayed. Usually we were taken on two snorkels in the morning at different locations. Afterwards, we went back to the resort for lunch or went to small islands with a barbecue station where we were served fresh-caught fish, as well as chicken or pork. Following the ample meal, we needed a nap before the usual afternoon snorkel. Ah, the island life! 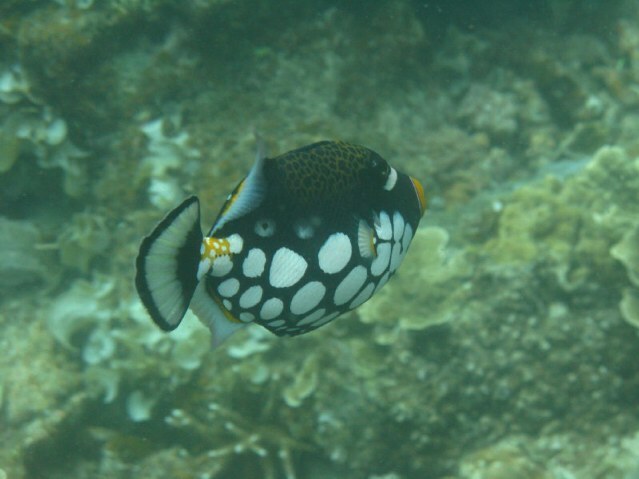 We saw many vanities of colorful wrasse, several pennant fish, many garishly decorated trigger clowns, as well as varied species of butterfly fish. 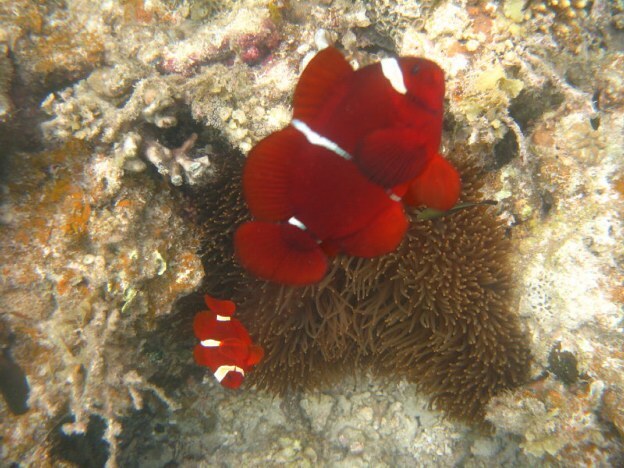 We were amazed by varied colors of “clown” anemone fish which had adapted to the shade of the anemone they lived in. There were a variety of colorful nudebranch to be seen. At some spots, beautiful corals and sea plants were the feature. At the end of the day, we were worn out and slept well. As well, at all locations, we enjoyed going in the water just off the beach. At Lagen, beneath some plate coral, we found a family of oriental sweet lips, which included the bizarrely decorated juvenile. At Apulit it was fun to swim under the water bungalows seeking out the friendly sharks. They were having a great time and ready to spread the word that Americans should take a new look at the Philippines with El Nido in mind. Like us, they declared that there is no better tropical vacation spot – and at a great price. Rates in Miniloc and Apulit include meals and activities. They start at about $220 per person, per night (double occupancy). In Lagen, rates start at $235, with an option to include meals and activities. Prices include the round trip flight from Manila.